Thanksgiving is just a few days away, and I'm so excited to sink my teeth into some delicious foods. 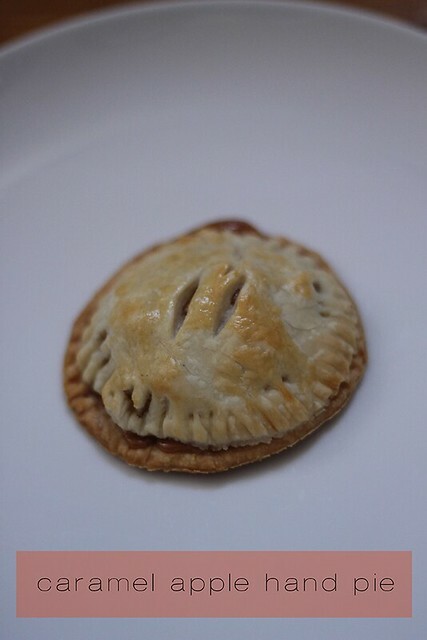 This weekend, we had a Friendsgiving with some (you guessed it) friends, and I brought these caramel apple hand pies. Hand pies are a little more practical than a full pie in some situations. You don't have to deal with cutting and serving and all that jazz. You just grab one and go. And with more than 20 people at Friendsgiving, simplicity was key. Also, I have a secret: I always use prepared crusts. I'm just not very good at making my own crusts and it's way easier to use prepared. So shoot me. Combine your apples, lemon, cinnamon, sugar and flour in a bowl and set aside. Preheat your oven to 425 degrees. Unroll one of your pie crusts on a floured surface, and cut out 3-inch circles using a cookie cutter or a cup. Gather up your remaining dough, and roll it back out and keep cutting until you have no dough left. Repeat with your other crust. You'll end up with about 36 circles. Place six of your circles on a Silpat or parchment-lined baking sheet. Spoon a small amount of apple filling onto each circle, then a few bits of the chopped caramel. Place another circle on top and crimp with a fork to seal. Brush the top with egg, then slice two or three slits into the top of each pie. Bake for about 12-14 minutes, or until the top is golden brown. Let cool for about 10 minutes and serve! If you make them let me knowwww! Okay, this looks amazing! You KNOW I saved this post to impress my family this holiday season. having made my first ever pie crust from scratch this summer, I will never be making it again. yay you and your cute pies! ohhh holy cow, this looks delicious. i've never tried any pie or pie variation besides pumpkin, but this might make my list. GIRL! Apple pie is my fave. You must try. i want this right now. please send to me.